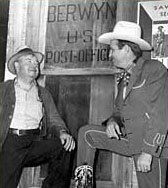 The residents of Berwyn, Oklahoma, peacefully coexisted with the name of their town for over half a century until Gene Autry and his Flying A Ranch Rodeo arrived. 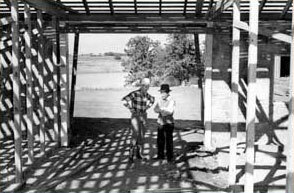 In 1939, Gene purchased 1,200 acres on the west edge of town and began extensive construction, intending to make the ranch the headquarters for his rodeo. Included on the property were two 200-by-60-foot stone stables featuring inlays of the Flying A logo, which still stand today. In 1941, Berwyn resident and Deputy Sheriff of Carter County Cecil Crosby suggested that the town’s name be changed to Gene Autry to honor its distinguished neighbor. In order to accomplish this, several townspeople drew up a petition that was signed by all 227 residents. The sponsors then had to convince the Post Office Department, the Santa Fe Railroad, and the county commissioners of the change, and they all eventually agreed. The official change from Berwyn, Oklahoma, to Gene Autry, Oklahoma, took place November 16, 1941, also Oklahoma’s 34th birthday. The massive event was attended by 35,000 people and many luminaries, such as Oklahoma Governor Leon C. Phillips, Assistant General Manager of the Santa Fe Railroad J.P. Cowley, and Gene Autry Mayor Charlie Gillespie. The daylong festivities began at 7:00 AM and culminated with Gene’s live broadcast of his CBS Melody Ranch radio show from a flat car on the railroad tracks. During the show, he sang several songs, received a scroll from high school student Juanita Huston bearing the name of every Gene Autry citizen, and marked the change of the railroad sign. Three weeks later, the United States entered World War II, and Gene enlisted in the Army Air Corps. After the war, he sold the Flying A Ranch. Gene at the Flying A Ranch, November 1941. In 1990, the town decided to turn an empty school building into the Gene Autry Oklahoma Museum dedicated to the singing cowboys of B Westerns. In September of 1990, the first Gene Autry Oklahoma Film and Music Festival was held, and it has been held annually, with one exception, since then. The celebration lasts several days and features many outstanding performers, a memorabilia auction, question and answer sessions, and, of course, terrific food. The festival is considered a family reunion by many of Genes fans, who congregate to honor their silver screen hero. Click here to visit the official Gene Autry, Oklahoma website. Use the links below for information on the Gene Autry Oklahoma Film and Music Festival. Hear the Gene Autry Melody Ranch radio show broadcast of Berwyn, Oklahoma's name change to Gene Autry, Oklahoma on the DVD of Down Mexico Way.